﻿ What Symptoms Will a Sick Bat Display? What Symptoms Will a Sick Bat Display? There are a number of things that can lead to a bat becoming sick, injured, or dead. Disease is a very common problem – rabies, white-nose syndrome, and plenty more have all been linked to the flying mammal, but bats that show symptoms of deadly or dangerous diseases aren't allowed to stay in the roost for long. If you see a dead or sick bat on the floor, there's a good chance that the bat has been kicked out of the roost. The other bats in the colony won't want the injured or sick bat to stay around for long, not when there is a chance that she (it's probably a female in your attic or building) can infect the other members. If you attempt to handle that bat on the floor, you are taking a chance with your own health, putting yourself in the direct line of fire for rabies and other potentially deadly conditions. Bats rarely come out during the day – they are nocturnal animals, only coming out at night, around an hour or two after the sun has gone down. In fact, when bats DO come out during the day, it's probably because the bat is sick. It might not have rabies, but rabies-infected bats are known to be less fearful of daylight and humans (rabid behavior). 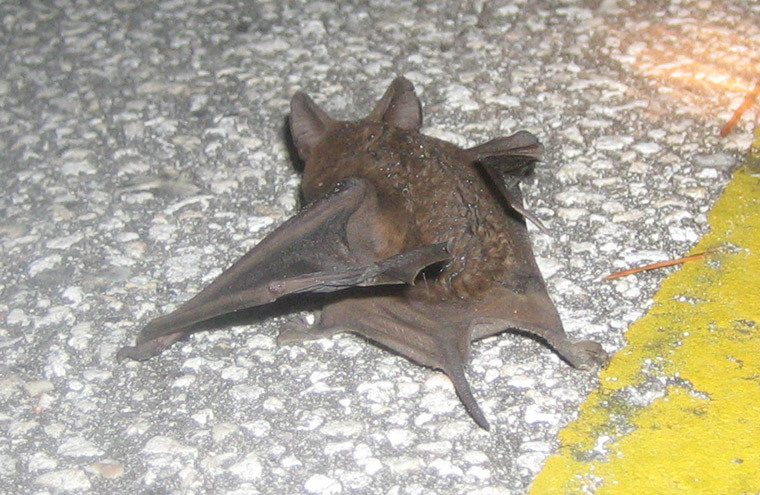 Other rabies symptoms in bats include an overly aggressive nature (bats would normally flee from humans, not attack), struggling to fly, appearing confused or disorientated (a bat wouldn't usually be on the floor, struggling to fly, not knowing where it is going during the day), and glazed-over or blank eyes. The latter will be quite difficult to spot as most people wouldn't be aware of what a bat's non-glazed-over eyes would look like. If the bat were suffering from another condition, such as white-nose syndrome, early symptoms might not be so easily spot. With the exception of the white fungus growing on the animals (which you may or may not be able to see), there are few other symptoms, apart from lethargy, lack of appetite, etc. Once again, these symptoms would be difficult to spot in a bat, unless that bat was physically lying on the floor in front of you. The moral of this story is that you should keep your distance from bats. A perfectly healthy bat can be infected with the rabies virus (in its early stages) without displaying any symptoms whatsoever. A bat that is out of the roost (or awake) during daylight hours is usually a sign that something is wrong – the animal is sick and has been kicked out of its home. If you keep away from ALL bats, whether they appear healthy or not, you can't put yourself in a potentially dangerous situation. Go back to the Bat Removal page, or learn about bats in the attic with my Bats in the Attic guide.